Building an ability to adapt to rapidly changing and disruptive digital channels and technologies is a higher priority for Toyota’s CMO than developing specialist expertise. Speaking to CMO during the launch of YouTube’s new preferred brand offering for advertisers, Toyota divisional manager, national marketing, Brad Cramb, said one of the biggest challenges brands face around new forms of digital marketing is whether to build in-house skills or to outsource. The marketing leader was one of several speakers at Google’s Brandcast event in Sydney last night marking the Australian launch of YouTube’s ‘preferred brand’ offering. This sees the video site packaging up a series of its most popular and fast-growing channels upfront for advertisers. Cramb, who presented on Toyota’s growing investment in YouTube as a media communications channel, said the brand was increasingly shifting from traditional advertising into delivering “context-based content” via digital. This had resulted in significant changes to his team’s skillset and resources. He also noted the extra resource required to build strong content. “The rate of change is faster than our ability to keep up with it,” Cramb said. “So what we are trying to do is grow our core competencies in iterating. During the Brandcast event, Cramb detailed Toyota’s growing investment into YouTube since kicking off its partnership in 2012, and outlined several recent activities and their success. Cramb told CMO the trigger point for its YouTube investment was the desire to innovate its brand portfolio and expand reach into new media. At the time, YouTube was allocated under the marketing team’s ‘test’ budget, designed to help marketing innovate within the context of brand filters, he said. “Yes it’s true our traditional buyer base demographic is getting older, but psychographically it is younger,” Cramb said in response to why Toyota saw a digital video channel favoured by younger digital natives as its preferred engagement vehicle. Cramb said marketing today is about utilising content to create a two-way engagement with consumers. 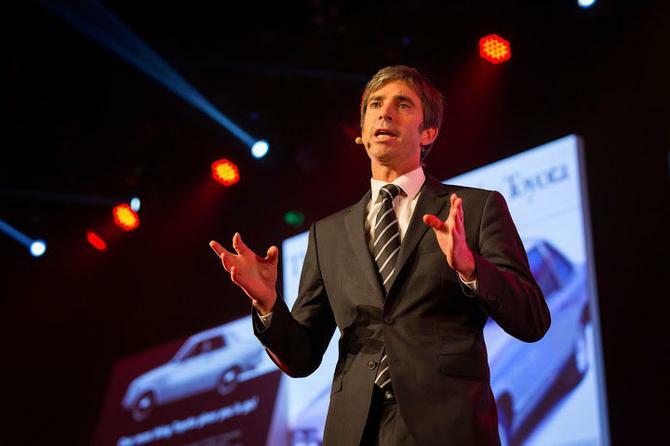 “We’re not in the car business, we are in the lifecycle business, connecting with people’s passions and what they like to do in their own lifestyle,” he told attendees. “Fifty years ago, the brand and sales would have been driven by traditional marketing and sponsorship activities such as TV. We launched iconic campaigns that were largely successful on TV and consumers would embrace it. In one campaign, we actually bought all the commercial space on all channels at the same time so no matter what channel you were on, you’d see a Toyota ad. It was about forcing people to see our content. Cramb pointed to Toyota’s FJ Cruiser launch campaign, which employed YouTube as the primary marketing mechanism using a series of multimedia content. Describing its content platform approach as ‘one way in, one way out’, he said Toyota dropped the FJ into the middle of an isolated area then shot video footage of the driver’s efforts to get out of the location. The campaign exceeded Toyota’s sales target by 171 per cent and exceeded its awareness target by over 80 per cent, Cramb said. “More importantly, we learnt we needed to be smarter about how we distribute the content, and the relationships we need to have to get there,” he said. Last month, Toyota launched its family friendly Kluger car through content that tapped into what it takes to run a modern family. The videos feature the star of Modern Family TV show, Phil Dunphy, sitting in the front of the car, talking to camera about its key features while discussing family issues. Content generated from these campaigns lives largely in the digital sphere, but has been amplified through all channels, Cramb said. Other recent examples of Toyota’s campaigns on YouTube include one for its new Hilux model, as well as user-generated content around its ‘legendary moments’ campaign. “This is the sort of stuff you can’t do on the traditional platforms that were available solely what were available to us five or 10 years ago,” Cramb continued. “We are distributing original content directly to our audience and they’re now distributing it straight back to us. To date, engagement with Toyota’s content on YouTube has exceeded 6.28 million minutes watch time and 11.2 million views. As a result of its success, Cramb said Toyota had increased its investment in YouTube by 47 per cent in the last year. Although digital still represents a smaller percentage of the brand’s overall media spend, he added there are plans to continue increasing that figure. “The scale is comparable to traditional broadcast. This is a platform that enables us to develop an engaging brand story and long form content, and a platform that helps us win in brand, win in retail, and win in engagement with our customers,” Cramb added. But while he advocated all brands step up their ability to interact directly with customers, Cramb warned any activity should be approached with caution.